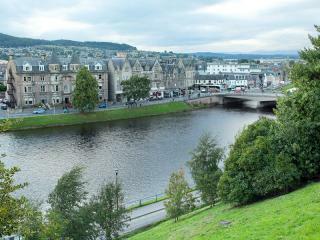 Inverness is the only "city" in the Highlands – a status it attained in 2000 as a millennium gesture by the government. 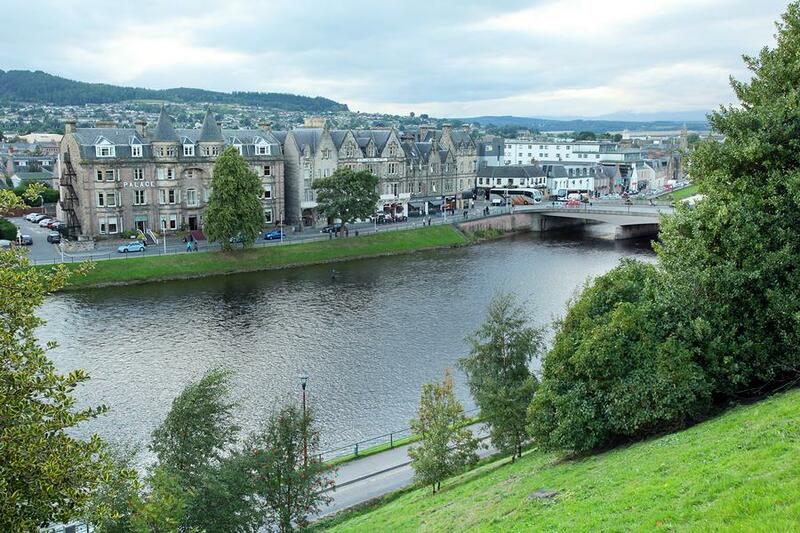 Though boasting few conventional sights, the city's setting on the banks of the River Ness is appealing. 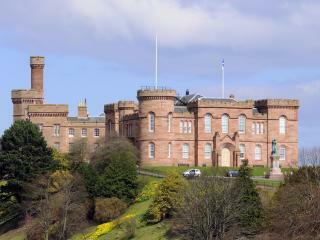 Inverness is an obvious base for discovering the attractions of Scotland's famous Highlands and Islands. The mountains, seacliffs, glens and lochs that cover the northern two-thirds of the country make up one of Europe's last great wilderness areas. The logical place to begin a tour of Inverness is the central 19th century Gothic Town House on High Street. 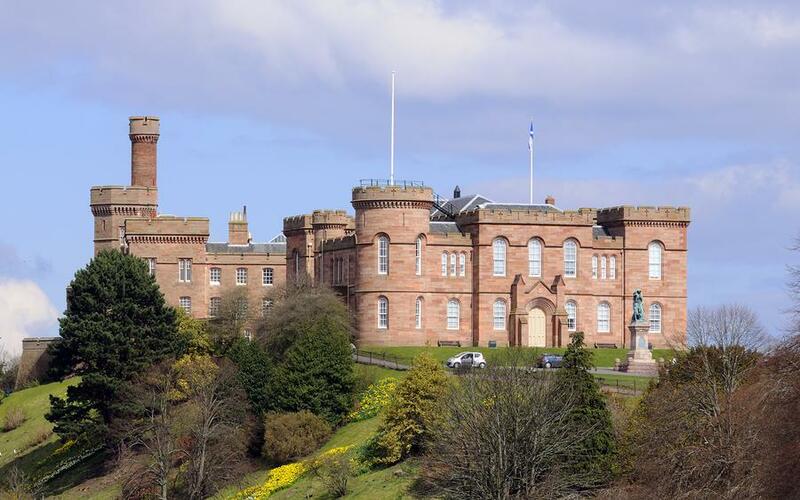 Looming above the Town House and dominating the horizon is Inverness Castle, a predominantly 19th century red sandstone edifice perched above the river. It houses the Sheriff Court and, in summer, the Castle Garrison Encounter - an interactive exhibition in which the visitor plays the role of a new recruit in the 18th century Hanoverian army. Below the castle, the Inverness Museum and Art Gallery gives a good general overview of the development of the Highlands. Informative sections on geology, geography and history cover the ground floor, while upstairs you'll find a selection of silver, taxidermy, weapons and bagpipes. The Kiltmaker Centre in the Hector Russell shop is interesting to visit. A visitor centre explains everything you ever wanted to know about tartan, and you can see various tartan products being made in the workshop. The finished products are on sale in the showroom, along with a good selection of Highland knitwear, woven woollies and Harris tweed. St Andrew's Episcopal Cathedral was intended by its architects to be one of the grandest buildings in Scotland. However, funds ran out before the giant twin spires of the original design could be completed. From here, you can wander a mile or so upriver to the peaceful Ness Islands, an attractive public park reached and linked by footbridges. The approach to the city on the A9 over the barren Monadhliath Mountains from Perth and Aviemore provides a spectacular introduction to the district, with the Great Glen to the left, stretching southwest towards Fort William. Beyond this are the peaks of Glen Affric. To the north is the huge, rounded form of Ben Nevis (Britain’s highest mountain), whilst to the east lies the Moray Firth, boasting a lovely coastline and some of the region's best castles and historic sites. The gentle and fertile green landscape provides a contrast to the windswept moorland and mountains that almost surround it. If you are traveling from Aberdeen, there is a lot to see en route to Inverness including the low-key holiday resort of Nairn, with its long white-sand beaches and championship golf course. Nearby is Cawdor Castle (featured in Shakespeare's Macbeth) and Fort George, one of several impressive Hanoverian bastions erected in the wake of the Jacobite rebellion. One of the main attractions of the Highlands is Loch Ness. Day tours depart from the tourist office or, if you have a car, you can visit independently. Loch Ness stretches for 37km from Fort Augustus almost as far as Inverness. Its bitterly cold waters have been extensively explored for Nessie, the elusive Loch Ness monster. Although some visitors claim to get lucky, most have to be satisfied with a visit to the fascinating Loch Ness Exhibition in Drumnadrochit. Nearby is the 14th century Urquhart Castle which was taken and lost by Edward I, held for David II against Edward III and fought over by everyone who passed this way. The castle was finally blown up in 1692 and its remains perch dramatically on the edge of the loch.